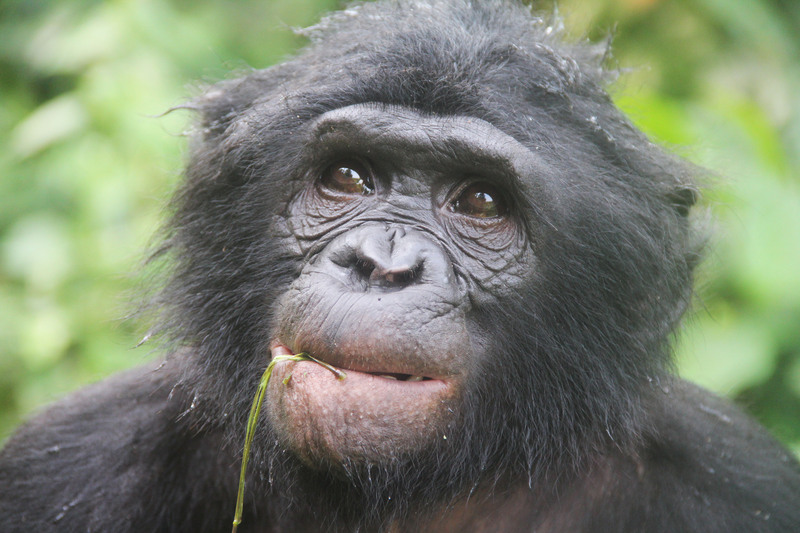 Great ape females are submissive to males — except for Bonobos. Bonobo personality in the wild is the subject of an article recently published in a scientific journal, American Journal of Primatology. A popular version has just come out; BBC Earth writes this about the article. A young male at Lola ya Bonobo, a sanctuary near Kinshasa. Photo by Cintia. The first author is our intern, Cintia Garai, who studied a bonobo group at Wamba, a field site maintained by Japanese researchers since 1973 in the Equateur Province of the Congo. She finished her PhD last year at Kyoto University, Japan. The personality of bonobos would be interesting to study in the Lomami Park too, especially because cultural differences between bonobo groups have never been evaluated. Unfortunately, we have not yet habituated bonobo groups in the Lomami. However, we do have camera traps and on the footage we keep discovering behaviors that we did not know about. Currently we are working on the analysis of these videos with the help of our primatologist collaborators. Here you can see some footage made of wild bonobos at Wamba. They are completely habituated to human presence and can be observed even from 5m distance. Genito-genital rubbing of bonobo females; a way to strengthen social bonds. At Wamba. A bonobo infant at the age of 11 months, at Wamba. This entry was written by Cintia Garai, posted on 2016-06-28 at 10:09 am, filed under Bonobo. Bookmark the permalink. Follow any comments here with the RSS feed for this post. Trackbacks are closed, but you can post a comment.